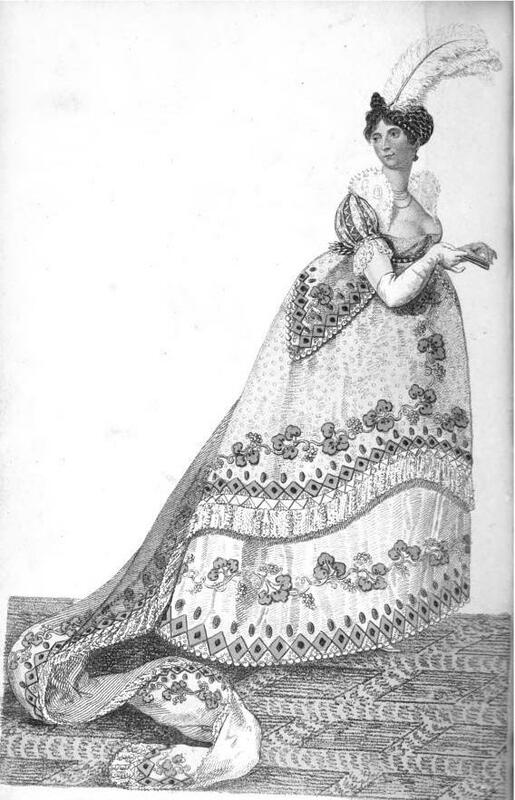 Represents a Parisian lady, mounted in the most fashionable style, for the Long Champs and Elytra, at Paris. 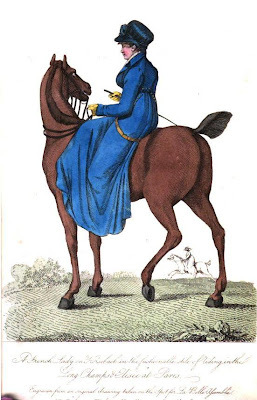 An equestrian habit of fine soal-wool cloth, with elastic strap; the colour blue (but olive, or puce, are equally esteemed), with convex buttons of dead gold. 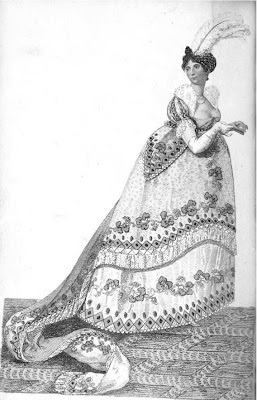 The habit to sit high in the neck behind, lapelied in front, and buttoned twice at the small of the waist; a high plaited frill of cambric, uniting at bosom where the habit closes. A jockey bonnet of the same materials as composes the habit, finished with a band and tuft in front. Hair in dishevelled crop. York tan gloves; and demi-boots of purple kid, laced with jonquille chord. This dress, for taste and magnificence, stood unrivalled amidst the splendour and elegance displayed on the Birth-Day of our justly revered Sovereign. The body and ground of the drapery was formed of a rich silver and lilac tissue; with a most superb border, composed of emeralds, topazes, and amethyst, to represent the vine-leaf and grapes. The train and petticoat of silver tissue; bordered all round like the drapery; and each terminated with a most brilliant silver fringe of a strikingly novel formation. Rich silver laurel and arrow on the left side, to loop up the train. Head-dress of diamonds and amethysts, tastefully disposed; with high plume of ostrich feathers. Neck-dress, the winged ruff, a La Mary Queen of Scots; sleeve ornaments to correspond. Amethyst necklace and earrings with Maltese cross; diamond armlets and bracelets. White satin shoes, with rich silver rosettes. French kid gloves, above the elbow. Fan of Imperial crape, studded with amethysts and topazes.